In the complex world that we’re in today, professionals and business owners value the importance of relevant advice from experts. 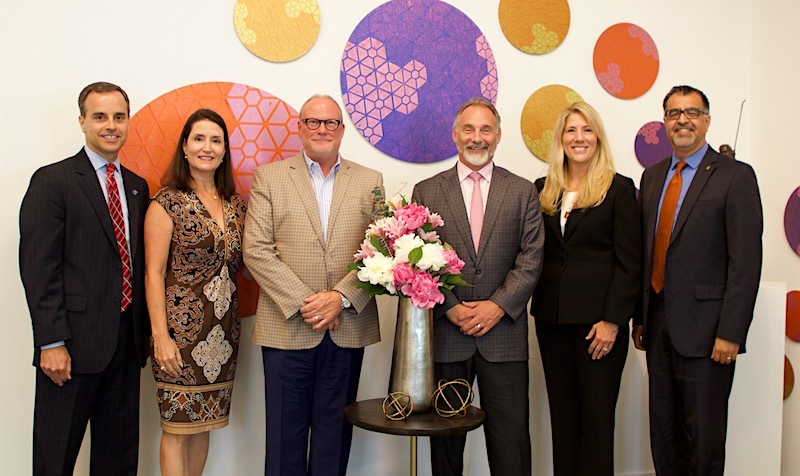 Starfox Financial Services brought together four distinguished business experts who are active members of The Woodlands community to participate in a panel discussion at Glade Arts Foundation as part of our business entrepreneur series. As advisors we have communicated to our clients how important it is to have a team of professionals in the respective fields that are represented here today. How do each of you convey the team approach to your business clients? What are the biggest challenges that you and your business clients are facing? How do you see this changing in the next few years? What are the top one to three ways that you in your respective fields of banking and consulting have helped your clients make a significant impact in their business that your clients didn’t expect? Can you give us some examples where you could have helped keep clients out of trouble, had the client hired you before they made major decisions? Share some tips for how business owners can better utilize their advisors in your respective field. Bret L. Strong, founder and managing shareholder of The Strong Firm P.C., has been a resident and an active community leader in The Woodlands, Texas for over 25 years. He spent 11 years with Shell Oil Company in areas of contracting, finance, and information services prior to becoming licensed in the legal field and establishing his practice in The Woodlands in 1996. Bret enjoys participating in all sorts of outdoor sporting activities, including skiing, running, biking, and swimming. He competes in triathlons and is a three-time Ironman triathlon finisher. Learn more about Bret and The Strong Firm P.C. at thestrongfirm.com/attorneys/bret-l-strong. Lynne A. Abercrombie, CPA, CGMA and Audit Partner of Abercrombie & Associates, PC, specializes in helping business clients understand the benefits of transactional planning for financial and tax strategies. Her experience encompasses all phases of financial and tax services with over thirty years of public accounting experience with closely held businesses primarily engaged in the manufacturing, distribution, service, construction, and real estate industries. Learn more about Lynne and Abercrombie & Associates, PC at AbercrombieCPA.com/staff/lynne-abercrombie-cpa. Bob Milner is a recently retired entrepreneur who teaches college and along with his wife, Teresa, runs a coaching and consulting practice, TerBo Performance. Serving 7 years as a decorated airman in the United States Air Force, Bob has spent the last 25 years leading luxury vehicle operations at a corporate level for 2 large public automotive retailers and as a managing partner and dealer. He currently serves on the Board of the Cynthia Woods Mitchell Pavilion, The Woodlands Chamber of Commerce, the Executive Leadership Advisory Council for Memorial Hermann – The Woodlands, Executive Advisory Council for The Interfaith of The Woodlands, Advisory Council for The Woodlands Luxury Alliance, the Glade Arts Foundation, and the Montgomery County Crime Stoppers. Learn more about Bob Milner and TerBo Performance at TerboConsulting.com. Judy Olson is the Market President of Spirit of Texas Bank, President of the Rotary Club of The Woodlands, and Board Chair of Child Appointed Special Advocates. Judy is a native of Conroe, Texas and has been in banking and mortgage lending in The Woodlands for 23 years. She earned a BA in Speech Communications from Stephen F. Austin State University and an MBA from Texas A & M University. Learn more about Spirit of Texas Bank at SOTB.com. Jose Palafox is the owner and managing member of Starfox Financial Services, LLC a Registered Investment Advisor (RIA). Starfox is a fee based financial group, with no commissions or hidden fees, serving the unique needs of the high net worth investor. His firm offers a tactical approach to wealth building and wealth preservation, which offers his clients a way to manage risk and address their financial goals. Jose has more than 20 years’ experience in the investment industry, having worked for two larger brokerages before starting Starfox Financial Services, LLC 10 years ago. He started Starfox Financial Services because he believed his clients deserved his full and undivided loyalty. Starting and RIA firm meant his clients and the community would have access to a true fiduciary advisor, one who had their best interests in mind not his own or the firms. Now, 10 years later, this fiduciary approach has allowed his business to expand to both Northern California and Texas and has resulted in having clients throughout the country. Learn more about Jose at StarfoxFinancial.com/our-team. Bill Friebel CFP®, CAP®, CRPC®, CDFA® is the Vice President of Client Services, Investment Advisor Representative at Starfox Financial Services. Bill has been in the advisory and consulting business since 1994, joining Starfox Financial Services, LLC in 2017. Bill was previously with Merrill Lynch for nearly 13 years as a Senior Financial Advisor and Wealth Management Advisor. A graduate of Kettering University in Michigan, he holds the CERTIFIED FINANCIAL PLANNER™* (CFP®) certification awarded by the Certified Financial Planner Board of Standards, Inc., Chartered Advisor in Philanthropy® (CAP®), Chartered Retirement Planning CounselorSM (CRPC®) and the Certified Divorce Financial Analyst® (CDFA®) designations. As a Past President of the Rotary Club of The Woodlands, Bill serves on The Woodlands Rotary Foundation Board a 501(c)(3) nonprofit, is a Rotary Assistant District Governor, a past Board Chair of CASA Child Advocates, and mentors small business owners as a volunteer with SCORE. Learn more about Bill at StarfoxFinancial.com/our-team. Special thank you to the Glade Arts Foundation for hosting the location of the panel discussion. The Glade Arts Foundation is a 501(c)(3) non-profit organization providing a unique and accessible fine arts experience with programs focused on art education, scholarships, community based public art projects and curated museum-like exhibit center showcasing local and international artists and acclaimed private and public art collections. Glade Arts Foundation is located at 2000 Woodlands Parkway in The Woodlands, Texas. Learn more at GladeArtsFoundation.org. Learn more about Starfox Financial Services and view their entrepreneur video series on their website at StarfoxFinancial.com.